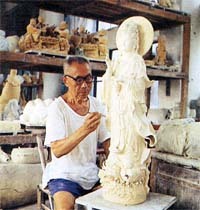 Located in northeast of Jiangxi, Jingdezhen, one of the ancient cultural cities in China, has a population of 290,000. It has been famous for porcelain ware since ancient time. Its white glazed porcelain was known as the "false jade ware" in the Sui and Tang dynasties. In the Ming Dynasty, it became one of the four famous towns in China, the other three being Foshan in Guangdong, Hankou in Hubei, and Zhuxian in Henan. There are over 30 scenic spots in Jingdezhen, including the ruins of ancient kilns in Hutian, the Porcelain Museum, the ancient Porcelain Mill, and the Research Institute of Porcelain.